The action shot – long-haired people, you know that move where you untuck your hair from the coat/jacket/cardigan you just put on? Meh. Now we’re back in weekend territory. See the difference when I pin it behind my back? Don’t know why I didn’t see this in the dressing room. It’s not terribly noticeable (especially when I’m wearing a coat/blazer), but not ideal. I’m not sure if I should re-donate it as-is so someone else can enjoy it, or take it to my tailor and see how expensive it would be to bring it in a little. With a spot of tailoring it could be a wardrobe star this summer when Atlanta hits 90+ degrees and 90 percent humidity every day. My overall feeling about this outfit? The color palette is right in my wheelhouse, and I love the way the coat looks over the blouse. 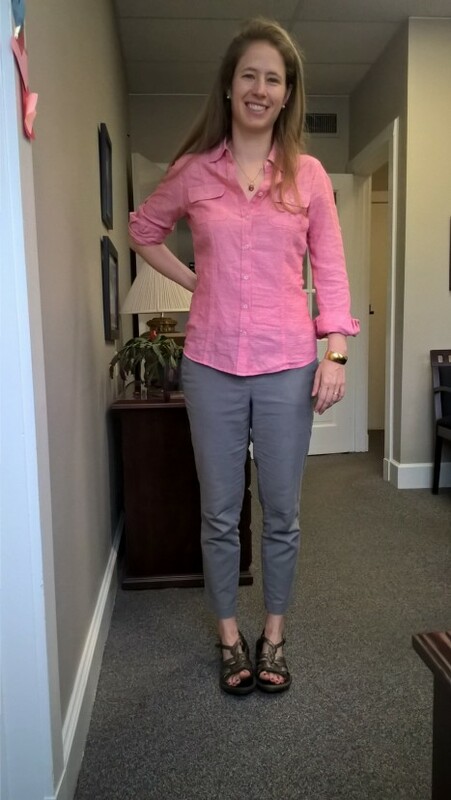 I am not happy with the fit of the blouse, but since I included it to get a better feel for how it plays with the rest of my wardrobe, I see that information as a win. I’m looking forward to pairing it with a skirt next week to see how it does tucked in, since the fabric is stiffer than the blouses I usually tuck. What do y’all think of the outfit? Would you donate the shirt or take it to the tailor? How’s your remix going? I love how the blouse fits you, but you prefer your clothing to be more body con. It’s probably a generational thing. I don’t want my clothes to just hang, but I like my pieces to be loose enough to hide a multitude of sins. Since this blouse doesn’t suit you, and the extra seams will most likely make tailoring a bit tricky, this may have to be rethrifted. But, I’m not a seamstress, so if you love the feel, the color, etc., I would take it to the tailor and see what they say. My remix has been a gigantic flop this time around. Sorry to hear it’s been a flop, Sandi! Any particular things you’ve learned from the flop? Your comments about fit actually made me think about this blouse differently. Because it has a “fitted” style (i.e. lines that follow the torso, those seams), I’d like it to fit me better. However, most of my blouses are made of more flow-y fabric and are cut tunic-style so that they skim my torso (or look sort of blowsy when tucked into a skirt) and don’t really conform to my shape. I like that, because like you I’m not particularly excited about things clinging everywhere or not having much give if my weight fluctuates (a concern if I get this shirt tailored). I used to have more form-fitting button downs and have given them all away! So I think it’s not so much a question of getting this shirt tailored but rather looking for a muted red shirt that has the cut/flow I like in a light cotton or linen mix. I have that shirt; in fact I have four of them from BR Factory a couple of summers ago. It’s the only long-sleeved shirt I can tolerate in Tampa Bay heat. I tried mine on to remind me of the fit and it is definitely more fitted on me than yours is. 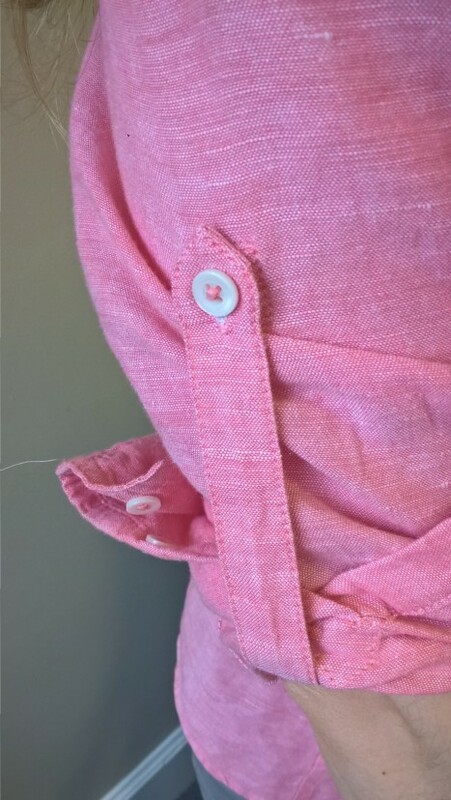 It would be easy to take some in at the sides — just run a seam starting at the original side seam at underarm, then gradually take it in further towards the middle (at your waist), then gradually lessen towards the original seam as you get to the bottom of the shirt. You can easily approximate this with straight pins to see if it does the job for you (and you can easily sew by hand). Another couple of ideas if you’re not ready to give it up yet — wear over a close fitting white/navy/black/striped tank and tie together in a knot at the bottom leaving the shirttail out in back. You can leave as is, or button up towards the knot. I tried it and really liked how it looked. Or wear as an overshirt, again over a tank, cami or shell. Tie on a small silk or chiffon scarf (or bandanna) at the neck. 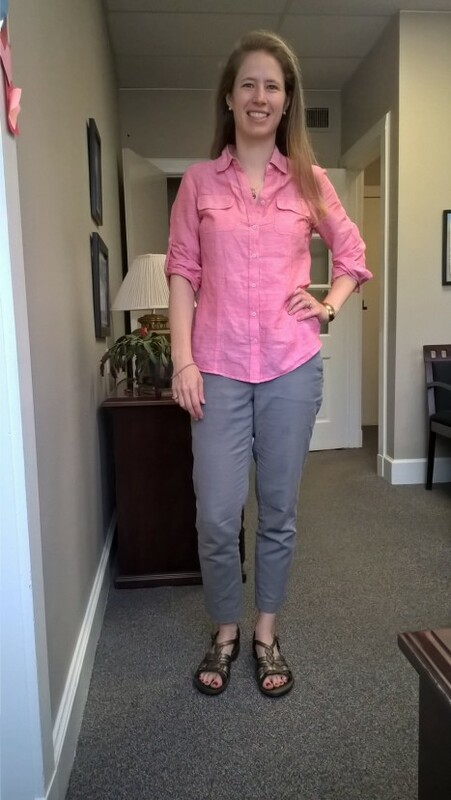 If I’m wearing something as wrinkly as linen and cotton on top, I try to make sure my bottom is immaculately tailored and relatively wrinkle-free fabric so I don’t look like a wrinkled mess. But, if you still find yourself not wearing, or trying too hard to like, it’s probably not the shirt for you, nice as it is :) I really enjoy your blog (I’m a former BR manager, sewer, thrifter). P.S. It would make a great weekend shirt to wear with your jean shorts also! Kristin – how cool is it that you have this exact same shirt? And great styling suggestions – I feel like I have a stylist!